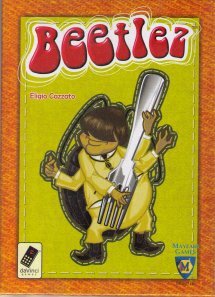 In Beetlez, the players are funny little musician-beetles looking to grab as many leftover foods as they can in the basement of a rehearsing pop band. But beware! When the light switches on, only a quick eye and hand will allow you to get to safety! A game of quick eyes and quick hands for 3 to 6 six-footed musicians, aged 5 and above! United Kingdom: some years ago: in a humid basement, a pop band rehearses their songs over and over. The musicians are so busy that they are using a small sideboard, so they wonâ€™t have to take a break and go out to eat. But when night falls, some beat beetles sneak out from the cracks in the walls and attack the food... if the drummer doesnâ€™t come in and squash them!